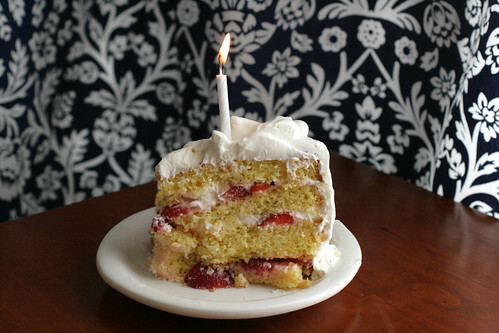 One year ago today, I was sitting around with nothing to do, and so I started a food blog. OK, it didn’t exactly happen like that. If you’ve been reading along, you have probably realized by now that I have a life that’s rather full, what with my full time (not food-related) job, a wild monkey of a two year old running my household, and a husband to boot (though given his childcare and dishwashing contributions, I think the husband nets positive in the time calculations). But I still make the time to cook. It was my hope, when I started this blog, that I could give a little insight into how real people prepare their meals. Cooking good food, from scratch, can fit into a busy life. And I hope that in this past year this blog has inspired you — to cook when you otherwise might not have, to change up your routine, or to try something new. This blog has certainly inspired me. It’s challenged me to figure out how recipes can be made more flavorful, more streamlined or more consistent. I’ve gone outside my comfort zone and discovered new foods. And I’ve been able to write down and record some of my family favorites. So happy first birthday, The Domestic Front! Now let’s talk about a party. To celebrate The Domestic Front entering into the toddler stages, I’ve instituted a few changes that will hopefully make the blog a little more interactive and make it a better experience for you all. I’ve set up an account at Formspring, which gives you a forum to ask questions – about cooking, about food or about me. (You can ask me about anything, but I don’t promise expertise!) This is also a great venue if you’d like to make any suggestions or requests for post topics or recipes. I’ll try to answer some of the questions regularly on the blog. Additionally, I’ve made a few changes to the The Domestic Front Facebook Fan Page. If you head over there regularly, you’ll get access to the The Domestic Front RSS feed as well as information about what I’m cooking for dinner in our household this week, food books I’m reading, and my current favorite The Domestic Front recipes. The “discussions” tab also is a place where you can give your feedback or suggestions. I’d love to hear from you. Of course, a birthday isn’t a birthday without presents, and even though it’s The Domestic Front’s birthday, you get to take home gifts! This Friday, March 5, will kick off week 1 of The Domestic Front March Madness — one giveaway per week for the next four weeks. Details on entering will be posted Friday. And finally, where would a birthday be without cake? Since I and all of my immediate family members have fall birthdays, I never get to indulge my yen for a creamy, dreamy light springtime birthday cake … until now. This cake is four layers of fluffy orange butter cake, sandwiched together with fresh strawberries and the simplest fluffy whipped cream frosting. The whole thing is not too sweet and very satisfying. I served it to the ladies in my book club (sadly, a blog can’t eat its own birthday cake), and not to brag, but almost everyone had two slices. These are Los Angeles ladies who lunch people. We are talking serious cake. If you, too, are craving a springtime cake for a birthday (or a book club, or no reason at all), try this one – you won’t be sorry. Preheat the oven to 375 degrees, and prepare two eight inch round cake pans. Zest the orange into the sugar, and cream the butter and sugar in the bowl of a stand mixer. Don't be shy at the creaming phase -- you want to incorporate as much air as possible into the butter. Add the eggs, one at a time, beating between each addition, and beat until the batter is pale and fluffy. Meanwhile, sift and measure the flour, and then sift it again with the baking soda and salt. Sifting flour is one of the secrets to a lighter cake. Mix the orange juice, lemon juice and water. Add the flour mixture in three batches, alternating with the juice. Beat only as much between each addition as necessary to incorporate the ingredients. Divide the batter between the two pans, smooth the tops of the cakes with a spatula or knife, and bake for 30 minutes, or until a cake tester comes out clean. Let the cakes cool, unmold, and using a long knife, carefully cut each layer in half to make 4 layers. Slice the strawberries, sprinkle with the granulated sugar, and set aside. In a small saucepan, combine the powdered sugar, cornstarch and ½ c. of the cream. Whisk until combined, and heat gently until the mixture is thick. Add vanilla; let cool to room temperature. In a mixer, beat the remaining cream until the marks of the beater blade begin to show. Slowly add the thickened cream and beat until fairly stiff. Combine about half the cream with the strawberries. Setting the first cake layer on a flat surface (I found that the flat bottom of my tart pan worked beautifully), spread about a third of the strawberry cream mixture on top of the layer. Add the next layer of cake and continue to stack the layers with the strawberry filling in between, finishing with the last layer of cake. Make sure the layers are stacked straight, and use a sharp knife to trim the edges. With the remaining stabilized cream, cover the exterior of the cake. Don't worry about crumbs, but try to get the frosting as smooth as possible. The cake can be refrigerated at this point for a few hours. In the bowl of a beater, combine the cold cream and sugar and whip until the cream holds soft peaks. 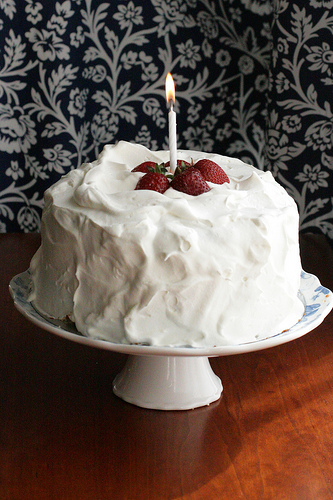 Spread it on the exterior of the cake -- you're aiming for billowy rather than smooth. Top with strawberries, sliced in half. Serve within an hour. Happy Blog Birthday! You’ve come a LONG way in just one short year! Congrats! Happy birthday! And thank you, thank you for this recipe–perfect for our upcoming birthday tea!! Congratulations! Only a year?? You’ve done a terrific job with this site. I can’t wait for all to come! Happy Birthday, and heres to many more blog. I’m going to make your cake for a BBQ we are having on Sunday. The light, not overtly sweet frosting is what drew me . Happy Birthday to your Blog. I enjoy every visit here. Thank you! Happy Blogging Birthday to you. Your cake looks really pretty. Happy blogiversary! Your site is so professional looking. I am always impressed. Yay! To another great year! Felizidades! I look forward to much good reading and eating in the next year. This looks so tasty and refreshing – happy happy day to you and the fam! I tweeted you a Happy Birthday, but I meant to comment here too. This cake looks so good! Happy Bloggie Birthday Kate! Congrats! Happy Blog Birthday! You’ve shot off like a rocket in your first year with many beautiful recipes and big accomplishments. Can’t wait to see what is next! Happy blog anni! Stunning cake that sounds as delicious as it looks. I just came across your website and i think it is great. This cake is just like a swedish birthday cake. Thanks for sharing. Hope to try some of your recipes soon. Check out my site. I can’t remember the last time I’ve had a SECOND piece of cake, but this one was so good I absolutely couldn’t resist. So flavorful, but light. I am copying this recipe and think I’ll make it for my Dad’s birthday in June. It’s the perfect cake for that time of year.